I am crazy busy with a few projects at the moment, but wanted to share some thoughts on a film I’ve been meaning to talk about for a while now. Late last year, I was able to check out the 2011 Swedish film Marianne by director Filip Tegstedt. After Krister (Thomas Hedengran) loses his wife in a car crash, he is left alone to raise his two daughters, one a rebellious teen (Sandra Larsson) and the other a newborn infant. Racked with guilt over the incident, he starts experiencing insomnia, sleep paralysis and nightmares about being visited by a spectral figure. Is it his imagination, or is something out to get him? I like this film because it is one of those titles that really creeps up on you. Marianne has a very surreal vibe running though it that echoes the protagonist’s mental woes. Past and present are mixed together to create this weird geography of events that is jarring at first, but somehow ends up suiting the material. This film features some very grounded and sincere performance, making this piece more about the characters than the story. This is likely why it didn’t bother me that the film’s end-game was apparent from fairly early on. It also helped that the film is saturated with an atmosphere of dread and despair, perfectly complimented by – my favourite aspect of the film – the music by Mikael Junehag and Kid Arctica. I love this stuff. It reminds me of the bands I was jamming to in the mid-nineties. The sound design in Marianne is also exceptional. I wager once you hear raspy tones of the Mare’s appearance, you won’t ever forget them. Speaking of Mares, this is also another recent film from Scandinavia that has mined its rich folklore for cinematic effect (Thale and Troll Hunter being two other examples). It is this spiritual foundation that keeps their film industry so unique and vibrant. A sizable amount of time had elapsed when I finally got around to writing about this, so I actually went back and watched it again. I think I liked Marianne even more the second time around, for I was aware of what it was, and what it wasn’t. 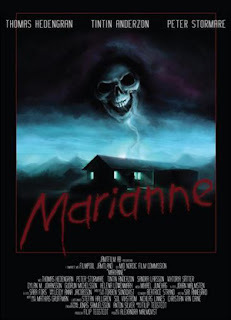 Marianne is a drama first and a horror film second, not the other way around, which, in this case, works in its favour. I can’t recall a film that has melded these two genres so well since – also sadly under seen – 2009’s The Eclipse with Ciaran Hinds and Aidan Quinn. Marianne is a bold, mature and heartfelt debut that lingers long after the credits have rolled. Though this film has still not received any kind of official release domestically, I urge you to keep your eye out for it, as these kind of genre-tinged character pieces do not come around that often.